The ASP is managed by our committee who oversee the ASP centre staff who, in turn, employ and organise the teaching staff. "I became a member at ASP in 1998 reconnecting with clay after a long break. I love the friendly atmosphere at the centre, the clay community, the exchange of knowledge. It is a unique and wonderful place. The focus of my work has been on wood fired shino glazed domestic ware and Japanese style tea ware. A few years ago I build a wood fired kiln at my place north of Auckland where I fire most of my pots." "It's great to be part of a Centre that is so vibrant and keen, with all the classes full. I am mostly a sculptor, sometimes a teacher and hopeful potter, and have been hanging around the place for a few years now." Toby has been with ASP since 2016 as Director of the Centre. He is in charge of the Diploma programme which is becoming more and more important to the life of the Centre, and is growing each year. Nadine has been working with clay for more than 12 years and involved with the ASP for most of that time. She works as a ceramic artist, making thrown and altered porcelain pieces. "I have been involved with ASP since 1975 as a member, since early '80s on the Committee (except for 5 years early 2000s when I was Centre Director) and later President for about 5 years. At the moment I use clay that is being thrown away so I take anything that is free and dry. Then I dry it or biscuit it and hit it with a hammer, firing the broken pieces (rocks) in a variety of kilns and then reassembling them into interesting combinations … teapots, platters, sculptural works." "I joined the ASP in 1995 when I moved to New Zealand, and after many years of casual potting completed the Diploma in Ceramic Arts here in 2011. I’m grateful to be able to contribute to the continued success of this special place, and to help build connections between the ASP and the wider arts community. Chris's approach is relaxed and he tries to facilitate an open creative atmosphere. His interest is in domestic ware, especially teapots and the humble mug. Chris did his first class way back in 1994 at Auckland Studio Potters and he hasn't left. Strongly influenced by the modernist movement, Graham’s primary interest is in the creation of minimalist forms. Whether in the shape of small pots or large sculptural pieces, his style can be easily identified by their simplicity of structure and striking glazes. Graham supplies only a handful of high quality galleries locally and abroad. His works are in increasing demand by both public and private collectors, nationally and internationally. "I did my first pottery class at ASP in 1993. I was training to be a teacher at the time and even though I really enjoyed making pots I had no idea that this would lead me into a career in the arts.I have enjoyed many roles at ASP from student to teacher and centre manager. At times I have ventured away from the centre but my love of working with clay and being in this wonderful supportive community always draws me back." "I took my first pottery class at ASP 10 years ago, and never left! I completed the Otago Polytechnic Diploma of Ceramic Arts in 2009. I was for many years a member of the ASP Committee. I have always been drawn to figurative sculpture; as a child I haunted the White Elephant stalls at school fairs and always found useless treasures. I struggle to make practical, useful objects, but I do enjoy knowing that I can. What I want to make are objects that have some sort of resonance with the viewer. My latest work is a series of animal boxes that began as both a play on words like horsebox, dogbox etc, and as a flippant attempt to make containers with ornamental knobs". 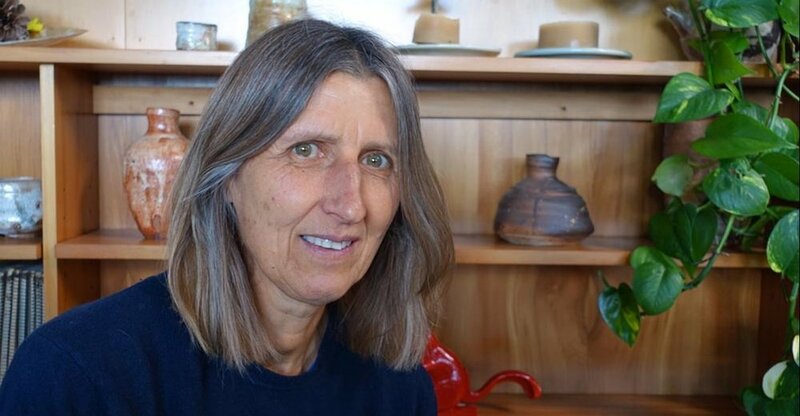 Renton has taught at many night classes and pottery schools and has been a tutor at the ASP for 10 years. He is a lover of pots; simple direct pots that are useable and that hopefully will enrich the lives of both the maker and the user. He is strongly drawn to wheel-thrown, salt-glazed pottery and fires in wood and oil kilns. "I found clay while in art school after many years thinking I was destined to be a painter, what happened next was a full fledged obsession which resulted in earning my Masters of Art and design. My Thesis's focused on learning, teaching and ultimately the Practise of Practice. My goal as a tutor is to ensure that my students leave my classes with good habits and understanding of clay and wheel throwing, but more importantly, I hope my enthusiasm and love of clay rubs off on them. I currently make under the moniker Good Girl Ceramics." John is our artist in residence for the first 3 months of 2019, as well as a specialist tutor. “While at Trinity College I was drawn to the music of the Baroque period. With baroque music, the form is usually very simple: a theme, containing just a few notes, is embellished or decorated to enhance the simplicity or to sustain the melodic line. Often the composer determined the structure in terms of chords, and it was up to the performer to extemporise his ideas, emotions and feelings with embellishments. Frank Checketts studied ceramics in the Art Department at Otago Polytechnic 1975 - 1976. "I have been involved with ASP for about 8 years and my role on the committee as of this year is now Vice President. I like to work with white raku or recycled clay and my best tool is a wire cutter to make slabs of clay. I specialise in using cut and textured slabs of clay and fire in an electric kiln at 1200 deg Celsius. I am also a theatre stage and set builder and I work for NZ Opera. For relaxation I blat all over the country on my motor bike". "I discovered clay later in life and have been attending classes on and off since 2010. I love the ASP environment and gain inspiration from the many talented potters and tutors who so generously provide encouragement and share their knowledge. Having recently built a studio and accumulating a few kick wheels my primary interest is in domestic ware. As Treasurer and new committee member I am pleased to contribute back to an organisation that gives so much." "Clay is a natural and earthy element – one I can readily relate to and work with in many ways; by hand, by wheel, by mold. I make functional and sculptural work in both my studio, south of Auckland, in rural Ramarama and in residence at artHAUS Orakei. Wood firing is my passion. Nature inspires me – the unique beauty of the plants and animals around me form the basis of the rich tapestry that is the circle of life. I love the relief, texture and colour that can be found in nature." Margaret graduated from the Diploma of Ceramic Arts in 2013. "I loved pottery on first sight in the 1960s but was far too sensible to become a potter back then. I’m less sensible now, and specially like working with earthenware and slips to create useful and useless things. I’ve been a class member of both Peter Stitchbury and Peter Lange for many years, and also found inspiration in Wednesday morning specialty classes. This is my first year on the ASP committee." Catherine has been a member of ASP for the last 18 years or so. She has been dabbling with clay as one of her creative outlets over that time. ASP has provided the space, place and opportunities for the development of that creativity and that is the principle that Catherine wants to support within the ASP identity and philosophy - that ASP is an inclusive, collective community - a group of people, passionate about the place of ceramics, pottery and art fostering that for anyone at any skill or competency level. Nina first came to the ASP in 2015, when she enrolled in the beginner’s handbuilding class with Jo and Helen. Since then she has moved into the office to work alongside Nadine and Toby. Having studied Textile Design at AUT, much of her work with clay focuses on exploring colour and texture.